I found this picture online and it made me think of my friend Alex immediately. He is obsessed with Teddy Roosevelt. Not only is Teddy Alex’s favorite president, but he is also one of his favorite historical figures—second to none other than Gandhi. When I met Alex, he had never been to Sagamore Hill, (Roosevelt’s summer home in Oyster Bay, Long Island) let alone heard of it—and he called himself a Roosevelt fan, whatta poser :). Since I live two towns over from and went to high school in Oyster Bay, I felt obligated to take him to Long Island and show him Sagamore Hill and Teddy’s gravesite. Alex didn’t learn anything on the tour because he already knew all Roosevelt trivia you can think of, but it was still a lot of fun. 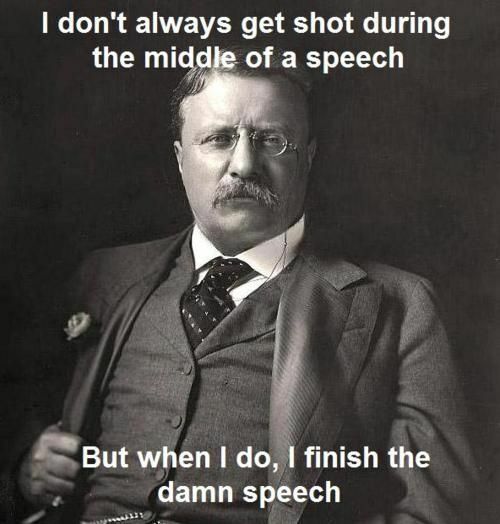 Anyway, the play on the “world’s most interesting man” meme pretty much exemplifies why Roosevelt is Alex’s favorite president—Teddy Roosevelt was a boss. The man was shot with a pistol at point-blank range during a speech, yet he went on to continue the speech before going to the hospital. So it got me thinking who is my favorite president? And why? Naturally, I knew the answer immediately. Abraham Lincoln, of course. No, I don’t pick favorite historical figures based on their political policies, remarkable actions, or heroic deeds. No, that would be too normal. Abraham Lincoln has been my favorite president ever since I discovered that his Gettysburg Address is widely considered the finest example of free verse in the English language. I can’t think of a better reason to pick a favorite, but let’s see why. Lincoln was attending an event to dedicate the plot of land that was to be used as the cemetery for those who had died in the Battle of Gettysburg—the turning point of the American Civil War. For the ceremony, Governor Edward Everett, who was known for his oratory skills, was asked to give a speech at the ceremony. He went on for over two hours before Lincoln gave his two-minute address. His Gettysburg Address was a mere and 272 words with ten sentences. He offered more meaningful, profound thoughts in those two minutes than many will in a lifetime. aloud, you can feel their powerful cadence and rhythm. You can only imagine what the audience thought that day when they heard the speech uttered for the first time. The speech also shows how Lincoln was a good writer. Contrasts in speeches get people’s attention. In the Gettysburg Address, there is frequent juxtaposition of contrasting ideas—for example, “those who here gave their lives that this nation might live”. There is an abundance of metaphors of birth, life, and death in the speech—namely through words like conceived, final resting place, and so on. The use of triads in a public address is also very compelling. Lincoln offers some of the most famous triads in history: “…government of the people, by the people, for the people” and “…we can not dedicate, we can not consecrate, we can not hallow this ground”. However, my favorite aspect of the speech is its irony. Take a look at the line, “The world will little note, nor long remember what we say here, but it can never forget what they did here”. Lincoln says that no one will remember a simple dedication ceremony for a cemetery, but his speech is regarded one of the best in American history. I am even writing a blog about it. Lincoln said these words years ago, but people will continue to remember them for countless years to come. I’d love to hear who your favorite president or historical figure is and why. In the meantime, here is a reading of The Gettysburg Address. Enjoy!